Part of DevOps is making sure that all of a company’s critical systems are fully functional and operating smoothly. To make sure systems are always up, the responsible DevOps practitioner must keep a vigilant eye on different parameters of all systems under her responsibility and make sure they are not over-used beyond their capacity. Each critical component, whether it is a software system or a hardware device may come with a user interface that allows you to monitor its activity, however if you need to run a different monitoring app for each of a multitude of systems and devices, detecting intensive activity on any one of them gets difficult. JMX offers a solution. JMX presents a universal and standard way for applications and devices to provide usage data exposed through an MBeans interface. 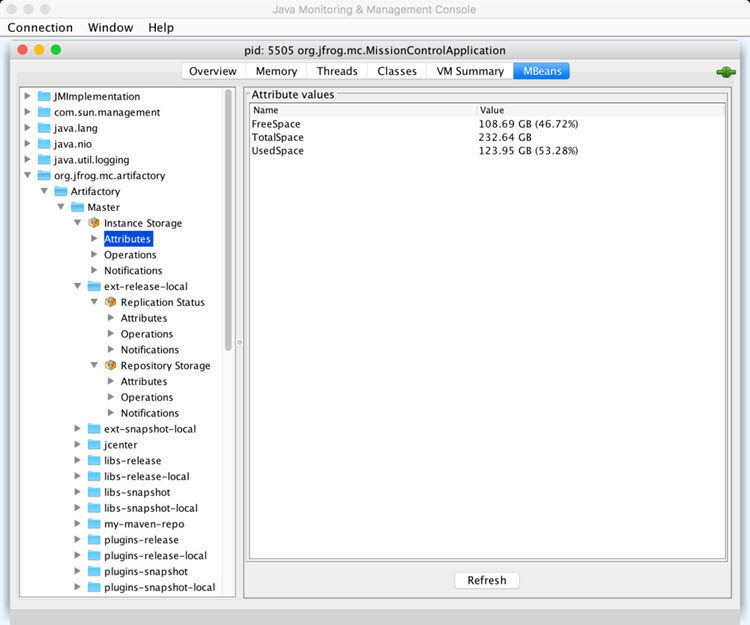 Artifactory implements MBeans that provide a variety of data that can be monitored by any JMX compliant monitor such as JConsole. Mission Control offers a number of JMX MBeans that provide data on Artifactory instances that it manages and the repositories they host..
By providing MBeans, Mission Control can easily be monitored together with all other JMX compliant applications and devices under one roof.